By popular request, we have added powerful new features to help you understand plant and flower production in WA state. Find top producers: see who added the most flower. Retailers, this is a great way to find upcoming product. Producers, this is a good way to keep tabs on the competition. 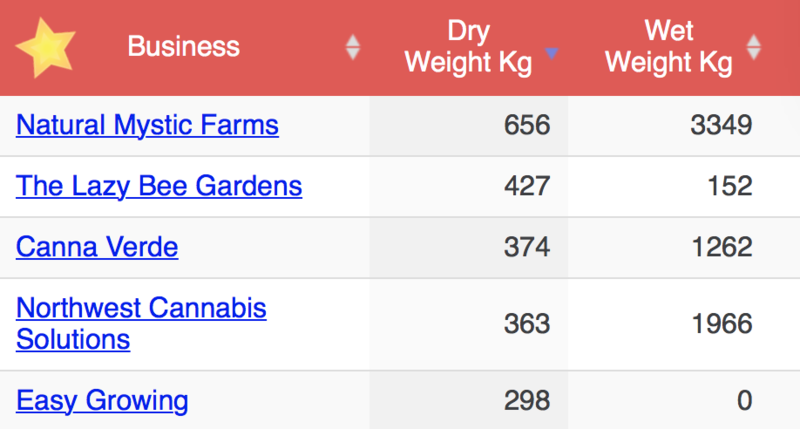 Congrats to the top 5 producers in Jan 2017 (by dry flower weight). See harvest trends: click on a producer to see their production over time. We show you dry weight, wet weight, trim, and waste. Natural Mystic Farms really ramped up production in Jan 2017. Nice work! View strains, trim, even waste: for any producer, learn exactly what they are growing, and their ratios of production to trim and waste. Producers will find this helpful for comparing efficiency. Explore plant lifecycles: see exactly when a business starts, harvests, or destroys plants. Producers can learn about best practices, and buyers can get a heads up on when product may appear. It's all in the Professional plan: these powerful new harvest features are available in our Professional plan ($99/month). We also have FREE and Starter ($49/month) plans to fit any budget. Come say hi at CannaCon: we don't have a booth, but will be wandering the floor. We'll also be at the industry mixer on Thursday night.